Discussing faceting machines with gem folks seems to be similar to asking car guys about motor oils, it’s guaranteed to generate some opinions. I’m contemplating the purchase of a Raytech-Shaw. The machine seems to have dedicated followers, and some are very experienced old timers who have used a lot of different equipment. If any of you Shaw users would care to comment, I’d sure appreciate some feedback about its upsides and quirks compared to a mast machine. Also, the latest production appears to have some esthetic changes, but I’m not able to determine from the small photos at their website what else is new. I asked the same question a while back. Lots of good answers. I'll post the link when I find it. In the meantime, do an internal RTH search in the white rectangle beneath the big RTH gear is here ad seen above. Pat, let me know if you have need of a 1200 Nu Bond lap. When we did shows in Texas there were two different demonstrators at various shows plus one regular customer with Raytech Shaw units. I stocked a lot of 6" accessories back then. I saw at Stoddard Wells I still have one Nu Bond 6" 1200 in stock. They were advertised as the ultimate pre polish lap and supposed to put a similar finish as a 3000 lap. I would love to find a good home for it. Thank you, Pat. The more I discover, the more I want to know. Been Googling for hours. I'm surprised by the use of "frog" type machines in some commercial cutting mills around the world. I've contacted Rick Scott and, hopefully, I can find out about his upgrades. Not a factor yet. 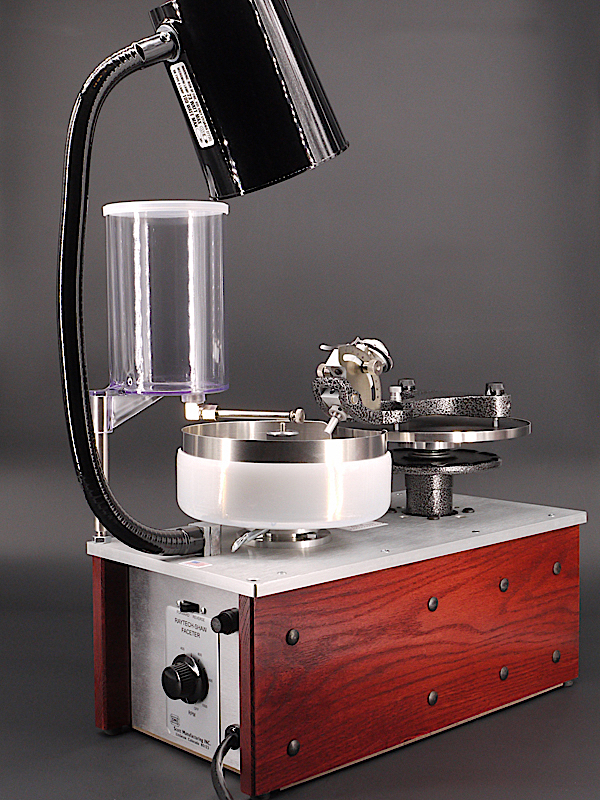 I wonder what I could use my Raytech-Shaw faceting machine for --- other than faceting. Could I make a 45 degree angle for an intarsia border? How would I hold the stone in the right position? Looks like stones need to be dopped to be attached to the frog. They make a brown facet wax that is lower temp but with higher shellac content to avoid overheating stones. I'm guessing CA glue would work fine too. I had an MDR machine I tried to use as a flat lap. The 600 rpm or whatever the high speed was took more patience than I had. I've seen cabs with facets cut on top that looked interesting. 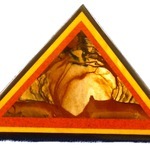 A faceting machine can make a precise angle of just about any kind, would definitely work for intarsia. Anybody buying a Raytech, do yourself a favor and get a dial indicator. And don't skimp on laps! The Havey tourmaline cutting video was lovely, but I don't think too many modern cutters use wax anymore. Faceting requires EXTREME patience, but the rewards are worth it. Would there be any connection with your suggestion and this www.campbell-gemstones.com/raydial/ ? I searched for more info but it didn't go anywhere. Many of us still use wax for at least one half of the stone. I use wax for the initial dopping for cutting the pavilion and then transfer using thick gel C/A glue. After the C/A glue cures put the assembly in the freezer for a few minutes and the wax dopped end let's loose without affecting the C/A glued dopped end. Others I know do the reverse and use C/A for the cutting of the pavilion and then transfer with wax into the cone or vee dop for cutting the crown. Unless there has been a recent design change on the Raytech Shaw machine, it doesn't accommodate a dial gauge without modification. And IMO adding one would be a waste of time and effort. 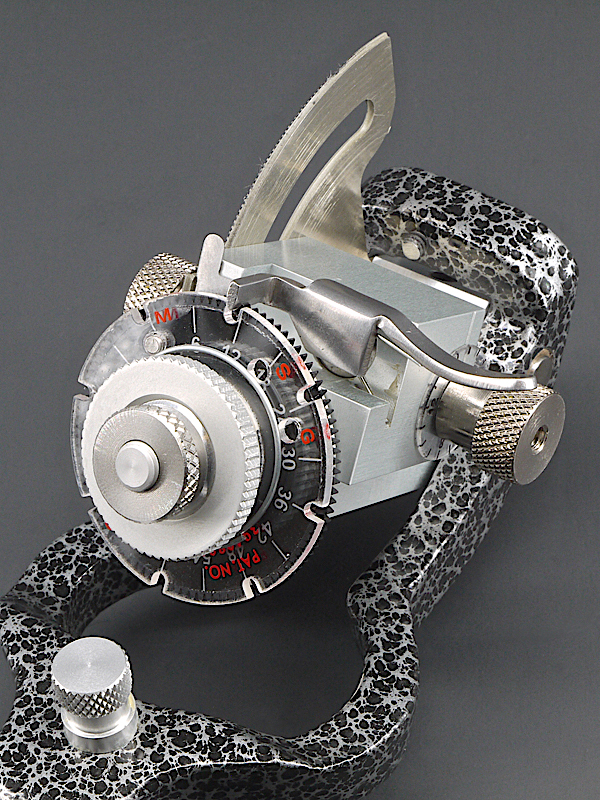 The Raytech-Shaw/Imahashi type designs are about as hard-stop as a faceting machine gets. So as long as even pressure is being exerted downward on the center of the handpiece repeatability on a row of facets is not a problem unless the handpiece platform, or the lap, or the lap platen isn't trued. In which case a dial gauge mounted on the handpiece isn't going to help anyway due to the rotational swivel movement of the handpiece platform. 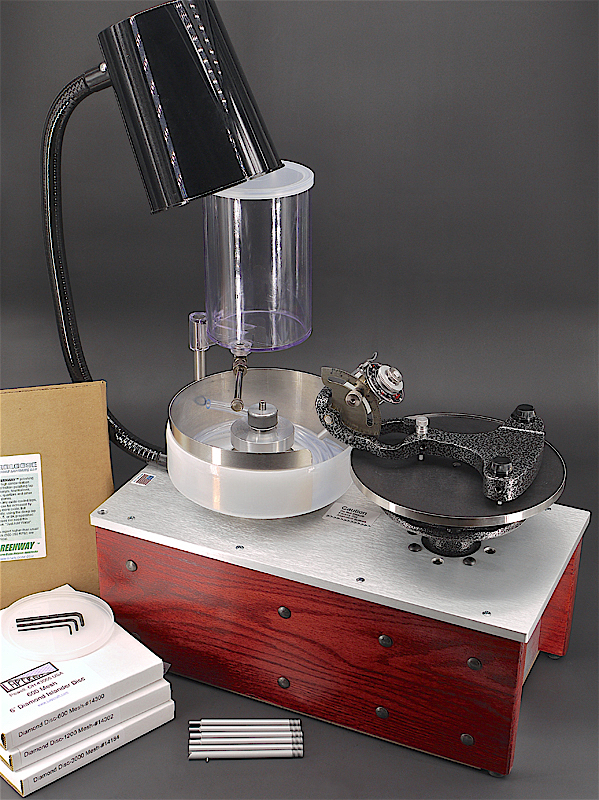 If buying a used machine a dial gauge mounted on a surface plate stand may be useful for checking/adjusting the alignment of a misaligned lap platen or for finding the most parallel (to the lap) zone of a warped handpiece platform table. But if buying a new machine neither of those scenarios will be an issue. And may not be an issue even if buying a used machine as long as the machine has been well taken care of. > a dial gauge without modification. And IMO adding one would be a waste of time and effort. > The Raytech-Shaw/Imahashi type designs are about as hard-stop as a faceting machine gets. The Raydial thing didn't make sense to me. When all three feet contact the table the handpiece is down as far as it will go. No need to have a dial confirm it. Aligning the Shaw surfaces is similar to tramming a milling machine where its column is adjusted to be perpendicular with the x-y-z table. 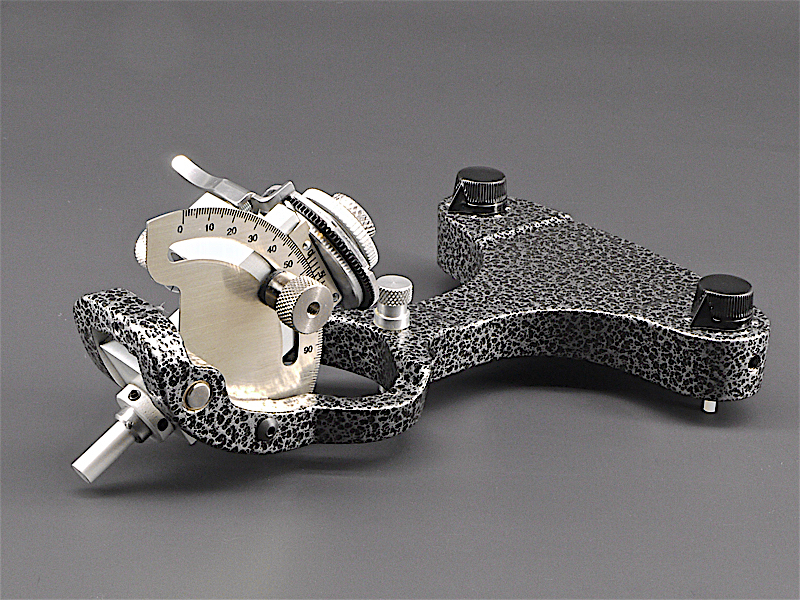 The perpendicular of the Shaw's handpiece platform can be tweaked with the four adjustment screws underneath. Which is precisely why IMO adding a dial gauge to the hand piece would be a waste of time for this machine design. ... Aligning the Shaw surfaces is similar to tramming a milling machine where its column is adjusted to be perpendicular with the x-y-z table. 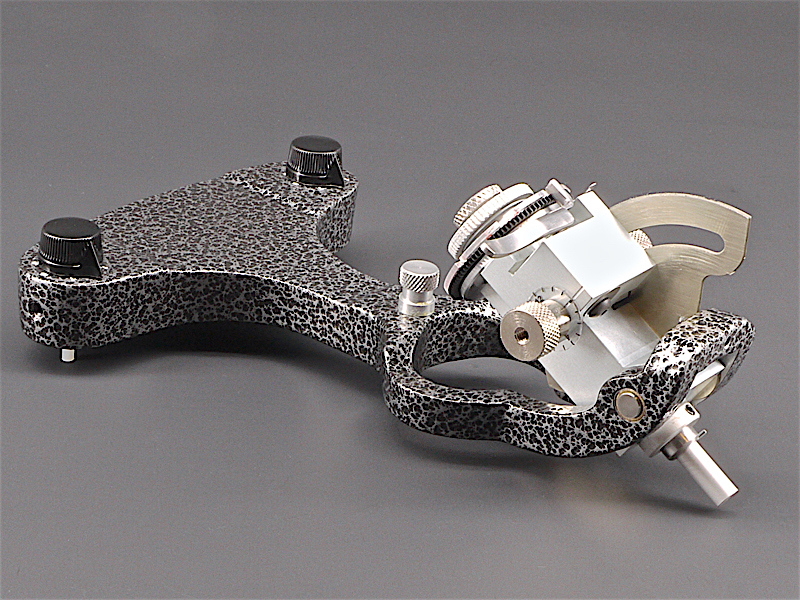 The perpendicular of the Shaw's handpiece platform can be tweaked with the four adjustment screws underneath. Not so if the handpiece platform isn't true. 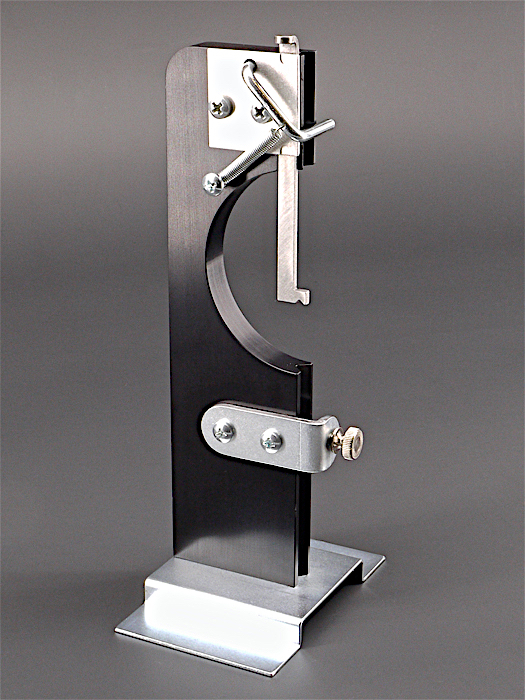 The adjustable set screws on the aluminum mounting bracket (that is mounted to the faceting machine base and which the hand piece table rod inserts into) only serve to adjust the angle of the steel rod that the round hand piece platform is mounted to. But the round hand piece platform rotates/swivels horizontally on bearings. So if the hand piece table gets warped or bent to where it is no longer a flat plane, or is no longer at a 90 degree angle to the steel rod mounted to the underneath side, then no amount of adjusting the set screws on the aluminum mounting bracket that the rod is inserted into on the base can correct that. In that situation the only way to compensate without ordering a new hand piece platform and rod assembly is to use a dial gauge mounted on a surface plate (while resting on the round hand piece table) to find the most level zone parallel to the lap platen, mark it, and then place the hand piece in that zone and use a large (preferably 1") flat dop mounted in the hand piece with the angle set at "0", and a machined flat lap mounted on the lap platen, and then adjust the three feet of the hand piece until the flat surface of the dop is sitting perfectly flat on the lap. Then always keep the hand piece aligned in that same marked zone when faceting. On a new machine or a well taken care of machine that will not likely ever be an issue. But if the hand piece platform assembly has ever been dropped, or anything too heavy has ever been sat on it, or if is was used repeatedly by someone using too much downward pressure, then it may be damaged "out of true". RE: dial indicators on Raytech-Shaw handpieces. I've cut over fifty but under 100 stones on my Raytech. So my comment is a product of several years of experience using it. With a Raytech one is cutting by ear. Very old school. When you cease to hear the slight rasping of stone being cut, you're presumably done. Sounds simple, doesn't always work that great. The noise is highly variable, and some laps make next to no noise! And while grinding away ever so quietly, some stones take forever to get where you need to be; especially stuff over 10 carats, hard stones, or variable-hardness stones. A 20 ct quartz, or a 30 ct CZ, oh my, that is just not much fun. Ten minutes on one of 85 or so facets... grrrr. When you can't hear the stone, and you can't see any progress, this will drive you crazy. I've spent over 30 hours on a single stone, so I know how this feels. Bear in mind that I'm speaking from experience here. So you have sound to go by, and there is also friction, tactile and visual, but even this combination of cues doesn't work all that well for every stone! And if you're cutting by sound, well, that means your cutting room had better be awfully quiet. I can work with low music, but I can't hear the lap if the treadmill is being used, and forget about TV, commercials are too loud. So, to make life much, much easier, you can retrofit your handpiece, cheaply and relatively easily, with a simple visual aid. You drill a vertical hole for the shaft of a small dial indicator, and a horizontal hole, tapped, to insert a small set screw with which to hold it in place. 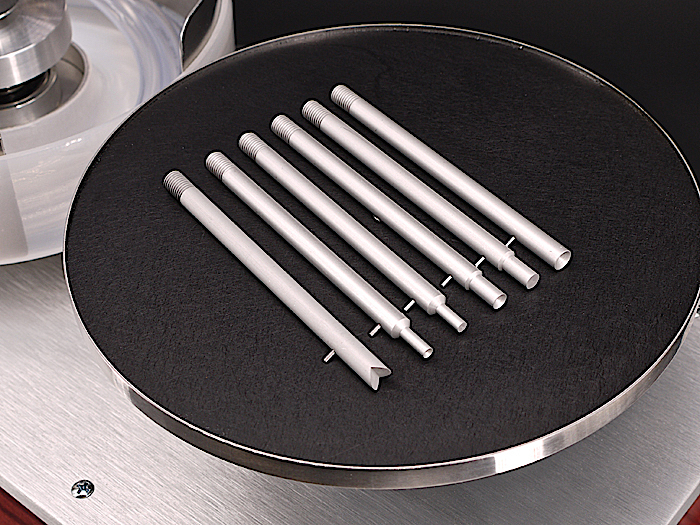 You set it and cut every facet to the exact same point on the dial, giving you near-perfect repeatability. I've used handpieces with and without dial indicators. Using a raytech without a dial indicator is madness. If you want to upgrade your handpiece, be sure you buy a small dial indicator, or it will inhibit the protractor movement, and make very sure you've got the clearance figured out before you go drilling any holes. And bear in mind that you may have to alter your grip a bit, but that's no big. slomoshun, your link doesn't work, but if you've further questions, ask away, hope this helps. Could be a bandwidth gate. I checked today and it opened with three different browsers, but it took several repetitive tries. I strongly agree with SirRoxalot. As a Raytech-Shaw user for many years and LOTS of stones I sent my machine to Campbell for alignment and a dial indicator installation. What a difference! One of the keys is finding the "sweet spot" on the platform and marking it. Even on my gently-used machine there's a very tiny tilt, so aligning it consistently with the lap surface is critical. I even installed heavy rubber bands to limit platform rotation so the handpiece is always sitting on the same proven accurate spot when I'm cutting. Even though the R-S is a hard stop machine there's enough flex in the platform on mine to allow overcutting on facets. My cutting speed, accuracy and user satisfaction improved remarkably after installing the dial indicator. But opinions -- especially about faceting -- are like that other thing everybody has one of. This is mine. It arrived, and I snapped a few photos. Laps included are a Lapcraft 600, 1200, 3000, and a Greenway. Had to have a peek inside. It's simple and tidy like the outside. 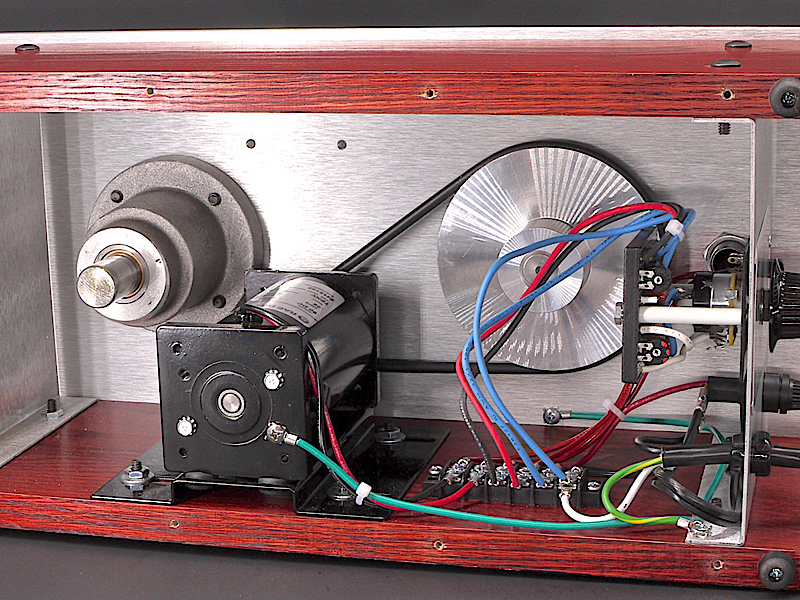 Someone mentioned using the Raytech-Shaw for creating intarsia. 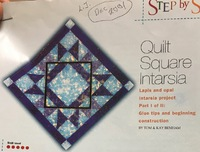 Although most here will be primarily interested in faceting, I thought I'd offer up some references on how this machine can be and has been utilized for creating fine, intricate intarsia. 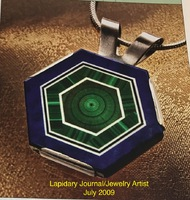 Sometime in the late 1990's Tom and Kay Benham (of Lapidary Journal Tips and Techniques column fame) became seriously interested in using a faceting machine for creating intricate intarsia after studying with Phil Magistro, Jim Kaufman and Nicolai Medvedev. Their machine of choice was a Raytech-Shaw as it seemed to more readily lend itself to intarsia. For many years they taught intarsia classes and published numerous articles in Lapidary Journal and Rock and Gem magazines. If anyone is interested and can find the old issues, here are references to 3 of their step by step articles.